Once the annual storm of January sales madness recedes, what will the retail landscape look like? We take a look at how consumer experience, smart services and immediacy will rule. These are very interesting times for retail, with more options for consumers than ever before. This applies not just to the vast choice of products and suppliers, but also to the way people shop, with varying levels of speed, convenience and all-round satisfaction. Why simply buy products mindlessly when you can make it into an enjoyable excursion? These days, shopping isn’t just shopping. It’s a reason to get out and about; have a coffee and a catch-up; discover new things and perhaps even achieve some extra errands. If you can do it all in one place, then all the better. Stores that offer more than simply aisles of products are much more appealing to today’s consumers, who delight in sampling services and consulting staff. For example, several John Lewis & Partners department stores don’t only have a personal styling service for clothes shopping, but also a beauty retreat offering drop-in eyebrow services and other little treats. And, of course, numerous coffee bars, cafes and demonstration stations for new products. The presentation and signposting of these areas is vital, as they must be enticing enough to make shoppers view their visit as a varied day out; while also attracting attention within the busy environment of a large store. The Internet of Things is forever growing, with the number of mobile devices on the rise alongside legions of smart household appliances such as fridges and televisions. These generate a wealth of consumer data that can be used to enhance shopping experiences for individuals. Some mobile applications have the ability not only to recognise the store that a shopper has entered, but also the department within it – so can alert them to relevant offers as they browse. Of course, it’s important that these offers and products are easy to find once the consumer is aware of them, so displays must complete the user journey for a smooth experience. Local demographics are also increasingly being recognised by retailers, who may format their stores to match the needs of the area – in style, layout and range of products. This can mean a complex set of requirements for brands with a large chain of venues nationwide, therefore necessitating a strong strategy for the production of multilocation displays and point-of-sale messaging. While online shopping is often seen as a convenient answer, many products really need to be seen in person – and thus in-store – to make a final purchasing decision. But even this can have its limitations, as customers want to know how large items such as furniture will look once in their home. Augmented reality is helping to customise the traditional shopping experience by enabling customers to view 3D models of potential purchases in their intended context – for example, a sofa shown within an image of their own living room, from a variety of angles. This multi-levelled reassurance is attractive to today’s shoppers, reflecting the common practice of multi-channel cross referencing between stores and brands to secure the best deal or best fit. In short, consumers like to compare and contrast – and customisation can help to motivate a final decision. Just like Facebook Messenger bots for online shopping, we’re likely to see more robots and computers appearing in stores everywhere. The aim is that these smart consumer aids will understand natural language and help shoppers with common queries about products and services. Patience is certainly not one of society’s biggest virtues, these days. While online shopping is very convenient in many ways, same-day delivery is subject to logistical limitations and delivery isn’t always the ideal fit for busy people with unpredictable schedules, even if it’s a next-day one-hour slot. Going to a store, on the other hand, usually means immediate satisfaction – especially when paired with the right technology; for example, checking a local store’s stock before setting out. By contrast, unpredictability can be appealing to some shoppers – for example, visiting a food store and deciding then-and-there which products to purchase, based on freshness, provenance and availability. This flexibility ties in with an active, healthy living mindset, which is increasingly important to today’s consumers. 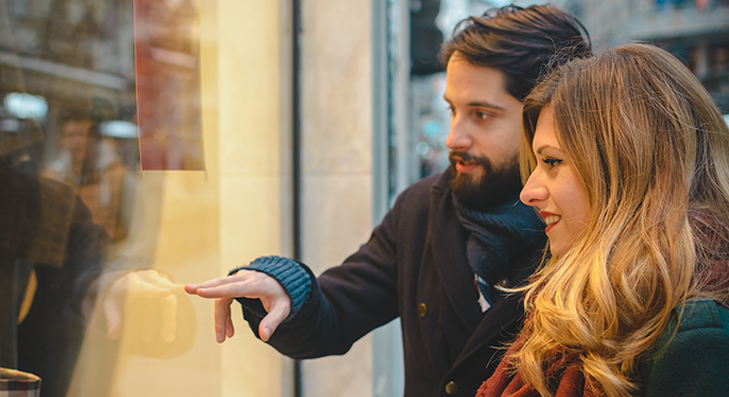 Is your retail brand ready for 2019’s consumer tastes? Take a look at our huge range of creative display products for well-known retail brands – and get in touch with our specialists to discover the best options for dressing your stores.